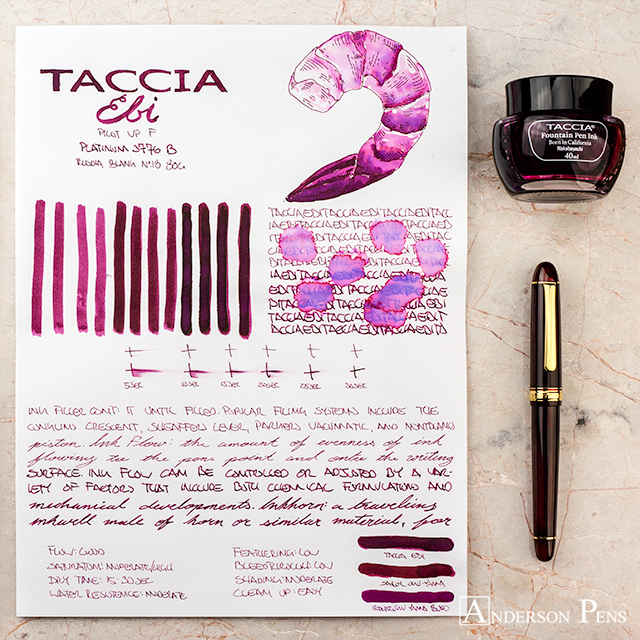 Could it be that Taccia Ebi is shrimply the best? 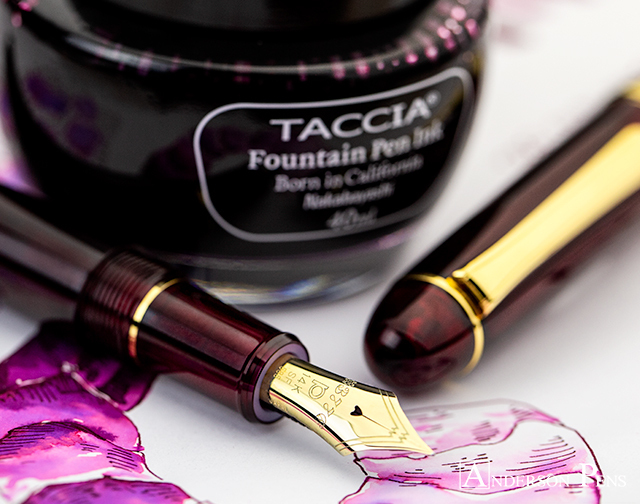 Until recently, Taccia has been primarily a pen producer, but they have just released a lovely collection of fountain pen ink. The palette of colors is similar to those of Sailor and Iroshizuku. 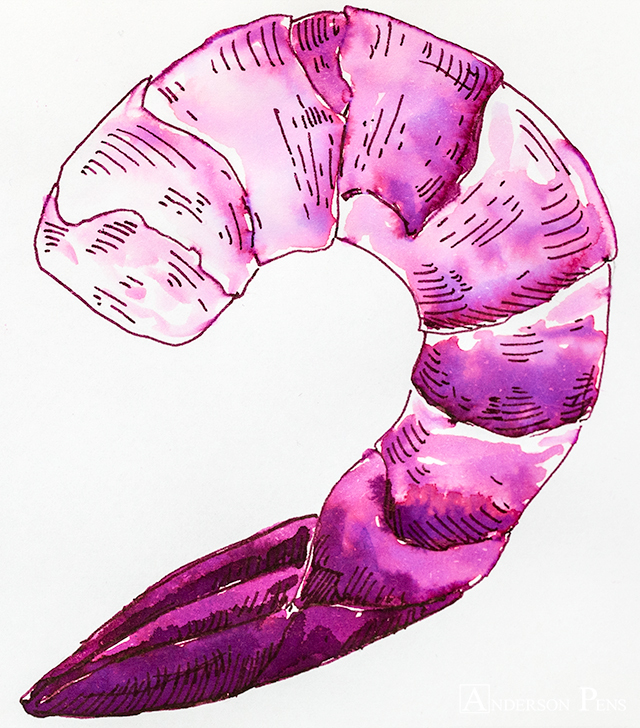 Ebi translates to “shrimp,” and is a fuchsia/maroon color. 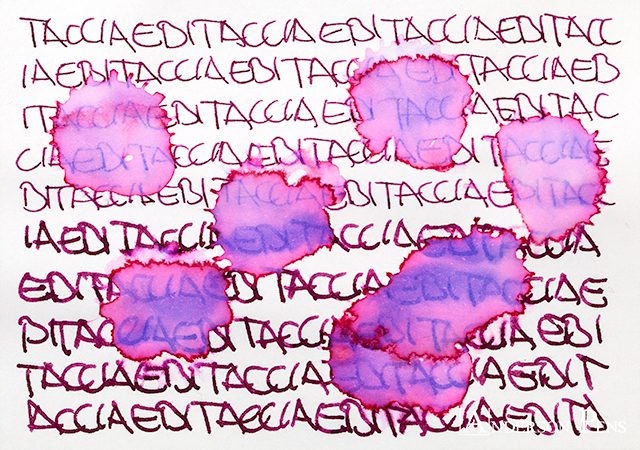 Taccia ink comes in a round 40ml glass bottle that is very easy to fill from. 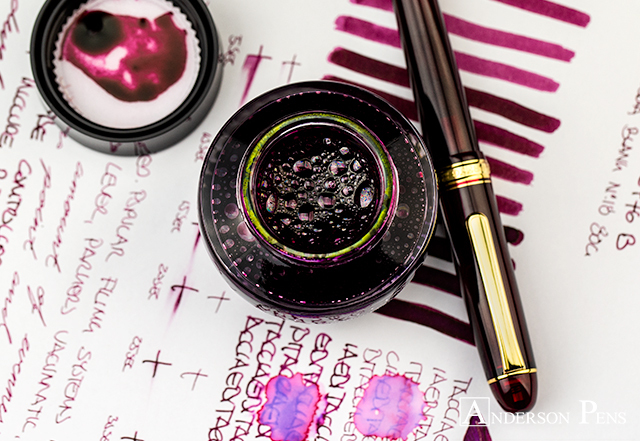 In addition to their beautiful colors, Taccia ink is well priced at $12 a bottle. This review was done with a Pilot Vanishing Point F and a Platinum 3776 B on Rhodia blank No.18 paper. 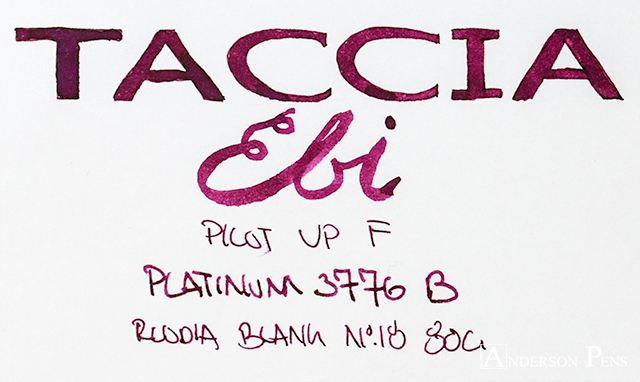 Taccia Ebi produces nice shading in both a fine and broad nib and displays a similar range of colors in both sizes. At its lightest, Ebi is a light ruby red. From there, it shades to a darker burgundy color. The darkest the ink gets is a deep mahogany red. On Rhodia paper, the ink didn’t produce any sheening, but on Tomoe River paper you get a gorgeous green sheen. 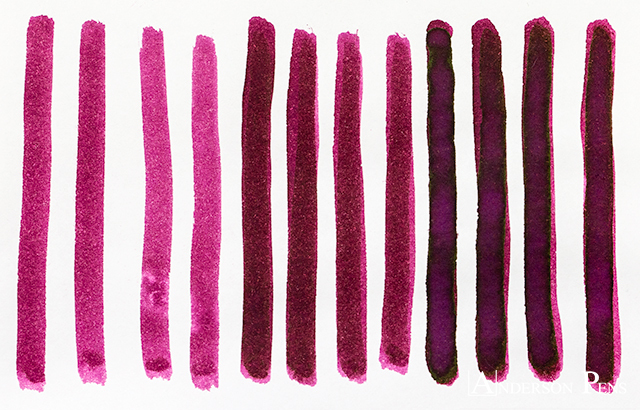 I’ve tested out a handful of the Taccia inks and I’m very impressed with their properties. Ebi had good flow with no feathering or bleedthrough on Rhodia paper. It’s a fairly saturated ink but still had good dry times at 15-30 seconds. Its water resistance was surprisingly good. While the red pigment washed away, the blue component was resistant enough that the writing was still easily legible. 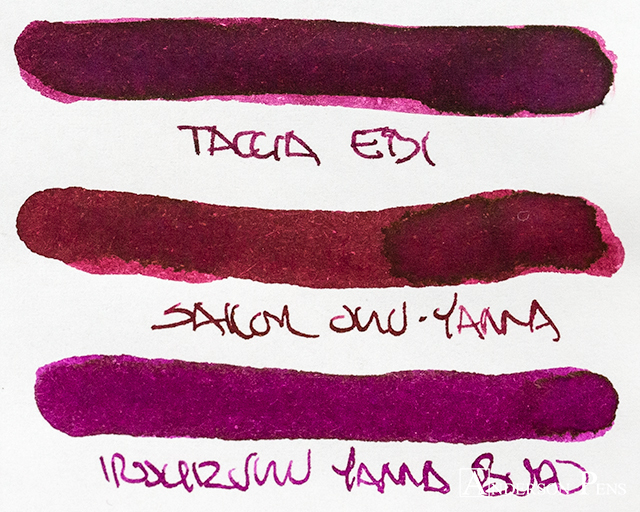 Taccia Ebi fits nicely with Sailor Oku-Yama and Iroshizuku Yama-Budo, and that’s great company. 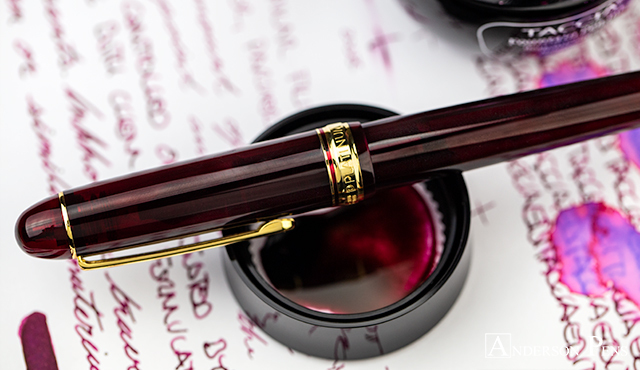 It’s a warm and inviting color that looks great in whatever nib size you favor. Its moderate water resistance is a happy bonus. 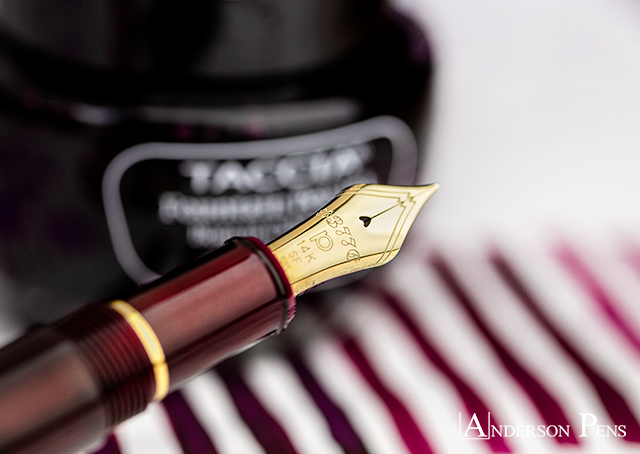 This entry was posted in Ink, Ink Reviews, thINKthursday and tagged ink, ink review, Platinum, Platinum 3776, Taccia, thINKthursday. Bookmark the permalink.